Amy X Neuburg was commissioned by the Cultural Department of Cologne, Germany, to create and perform a new interpretation of Jerry Hunt’s “Song Drapes,” originally a collaboration between Jerry and the performance artist Karen Finley. In homage to the intense and slightly disturbing nature of the original, and to the frantic occult-based compositions of Jerry Hunt (and his tragic end by suicide), Amy’s version is a one-hour song-and-rant cycle about aging, death, and suicide (but also kitties and flowers and rainbows). 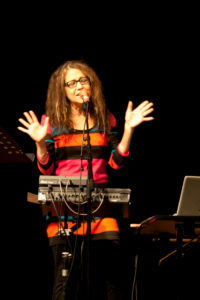 Jerry’s wild electronic textures serve as a backdrop to Amy’s lyrics, wide ranging vocalisms, electronic percussion, and choreography. One hour before the concert, excerpts of films by and about Jerry will offer some context and insight into his work and life.